For those who can't get their fill of winter sports during the day, there is always the option of continuing the fun in the early morning, or twilight hours of the evening. Because of the inherent danger of most winter sports it is important to have the best gear possible, especially when you are looking to illuminate your surrounding in low light situations. Several of our employees have taken it upon themselves to go out and personally test these products. Our interns have a passion for winter sports and have picked out the best Winter Sports flashlight. We've found that headlamps and EDCs that run on non-alkaline batteries, feature spot/flood output modes, and come with S.O.S./Emergency outputs are essential for your Outdoor Winter activities. Our pick for the optimal Winter Sports flashlight is the Fenix HP25R. 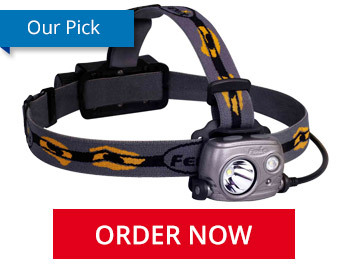 This headlamp runs on a rechargeable 18650 battery. Alkaline batteries tend to drain faster in cold weather so the Lithium-Ion battery will provide you a longer lighting solution. The battery sits on the back of the headlamp which helps distribute the weight evenly on your head. Moreover, the center strap of the headband lets it securely sit on a Skiing or Snowmobiling helmet. The Spot and Flood beam output lets you choose the light variation you need for each activity. If you are snow-shoeing to a night class the bright Spot will shine effectively, however, if you are snowboarding you might want a bright Flood beam to see a wider range. Additionally, the Red and Flashing outputs provide you with an emergency option to help rescue crews find you faster in case of an emergency. Our second choice for best headlamp would have been the Nitecore HC60 which is the slightly cheaper option, but the peak beam distance pales in comparison to the Fenix HP25R. When you are outside you will need to be able to rely on your light to see a safe distance ahead of you. While we believe the HP25R is the best choice for most Winter Sports, we know everyone has different preferences. Whether you want something a bit cheaper, something a tiny bit lighter, or simply a different style, we've made a list of our other top choices so you can pick for yourself! The Skier, Snowboarder, Snowshoer, and Snowmobiler all share a love of powder, but should not share the same exact qualities in their flashlight of choice. Snow enthusiasts should look for a flashlight that fits their specific needs, which can vary depending on terrain, skill level, and expected weather conditions. For the standard downhill skier lighting is usually not an issue that is considered. Most resorts close well before visibility conditions drop to dangerous levels, but for those who choose to ski back country or make their own tracks off mountain it is important to have a bright light that can illuminate a wide area, support a long run time, and have SOS/rescue modes for worst case scenarios. Flashlights can also be useful for daytime skiing applications as well, in the case of big mountain skiing people can frequently encounter conditions of skiing through clouds which can be helped by a flashlight with a narrower concentrated beam for cutting through fog/weather. The most practical lighting option while skiing is to use a headlamp because it provides hassle free beam directing and will keep your hands free for ski poles/balancing. However if you are on a longer trip it is never a bad idea to have a backup handheld flashlight in case of headlamp malfunctions or other unforeseen situations. Snowshoeing and cross country skiing are great safer alternatives to their downhill skiing/snowboarding counterparts, but still require careful preparation when being enjoyed in low visibility. As with downhill, it is important to look for hands free lights such as headlamps and angled flashlights with clips, because they allow you to easily handle poles and other gear. Because some snowshoeing and cross country skiing can occur on the sides of downhill mountain trails and main roads it is also important to outfit yourself with reflective, eye catching gear to readily announce yourself to the surroundings. Beyond wearing bright colored gear it is a good idea to attach reflective bands, stickers, or LED signaling lights to a visible spot on your person. Snowmobiling is another popular winter sport that can benefit from additional lighting gear. Most snowmobiles feature headlights, taillights, and reflectors but it is a good idea to keep additional lighting options on board just in case. Small handheld lights can be a great way to quickly illuminate something to the side of the trail or out of the headlights beam focus. It is also important to have a signaling device on hand in the worst case scenario that your snowmobile breaks down away from well traveled areas. Finally in situations for medical/law enforcement it can be helpful to have a portable spotlight for illuminating objects that are long distances away from the beaten path. Type of flashlight, style of use, and important features can vary depending on the situation, but their are certain winter time flashlight rules you should always keep in mind. SOS/signaling functions are a must have for any light. In cold winter conditions your time for being rescued is shorter than other emergency situations which makes having an attention grabbing function on your flashlight extra important. Extra batteries - because cold conditions during the winter can accelerate the drain on batteries it is important to avoid alkaline battery powered lights and go with lithium instead. Alkaline batteries are constructed with a water based electrolyte meaning that when temperatures approach or dip below freezing (32°F/0°C) you will see significantly reduced performance and run times. If you absolutely must use alkaline powered batteries then it is a good idea to bring an extra pair and hold them somewhere warm (chest pocket or inner layer of clothing) to prevent drainage (this goes for Lithium too!). Travel with a friend - Sometimes there is no way of predicting what can go wrong on a snow sports adventure, which means it is never a bad idea to go with another person. Should something unforeseen happen, having an extra person provides twice the gear, twice the brain power, a shoulder to lean on for injuries, and in the worst situations someone who can go get help. Always use the buddy system on long trips or when exploring new terrain.